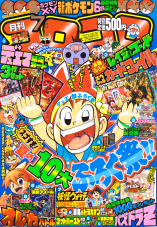 The manga adaptation of The Extreme Speed Genosect and the Awakening of Myuutwo was printed in CoroCoro Comics, a manga anthology magazine that goes on sale around the 15th of every month. 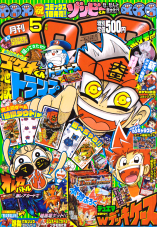 Three chapters were printed in the monthly magazine with a fourth presumably debuting in graphic novel form. In a distant land, five Genosect - one red and the rest purple - fly through the air trying to find the collection of pillars surrounded by a lake they call home. The legendary pokemon Myuutwo, meanwhile, has been made aware of the Genosect's presence and approaches them. After Myuutwo uses its incredible psychic powers to peer into the mind of the Red Genosect and find out their story, it is attacked by a quintuple Techno Buster! Once the smoke clears and the Genosect leave, Myuutwo identifies Genosect as a pokemon from 300 million years ago. Meanwhile, Satoshi, Dent, and Iris arrive in New Tork City. They make their way toward Pokemon Hills, a park divided into stages designed to mimic the various natural habitats of the pokemon who live there. They are met by Eric, an employee of the park, who leads everyone to a garden where every species of flower in the world are said to have been gathered. Satoshi decides to run ahead and look around some more. Satoshi and Pikachu reach a pond where a number of unique flowers are floating alongside lily pads. Suddenly, Pikachu notices a Genosect standing beside it! Satoshi goes over and sits on it, thinking it's just some kind of statue or something, when all of a sudden it rises into the sky! After flying Satoshi around the park a bit, Genosect switches over from its "High-Speed Flight Form" to its regular form and lands on the ground. 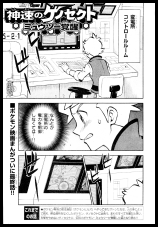 It then tells Satoshi "I WANT TO GO HOME," prompting the young trainer to promise to help Genosect find its home no matter what. Suddenly, Satoshi is attacked by two other Genosect! The Red Genosect reminds the friendly Genosect that it must "DESTROY ALL ENEMIES," triggering something inside the pokemon that causes its eyes to go dark. Suddenly, the Genosect who was playing with Satoshi just moments before turns toward its friend and fires off a Techno Blaster! Once the smoke from the ensuing explosion clears, our heroes see that they were saved by a barrier that was created by Myuutwo! After getting the introductions out of the way, Myuutwo tells Satoshi that the Genosect are trying to return home from 300 million years ago but cannot because it no longer exists in the modern world. 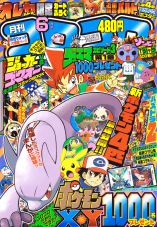 Later, over at the Pokemon Center, Satoshi and his friends tell Joi and Eric about the Genosect and Myuutwo they met. As our heroes think about the pokemon, Eric tells Satoshi about the Ortus (オルタス), the flower said to be the oldest in the world. Satoshi remembers seeing it in the park before meeting Genosect. Over at Pokemon Hills, the Genosect drive out all the pokemon. A Yamirami who had befriended Satoshi's pokemon earlier watches as the Genosect begin to make something out of silk. Their work inadvertently penetrates the ground and strikes the power generators located underground, causing power shorts in the rest of the city. Yamirami runs to the Pokemon Center, finds Satoshi, Iris, Dent, and Eric, and convinces the four of them to follow it back to Pokemon Hills. Once there, Dent sees an injured Ralts and decides to take it back to the Pokemon Center for treatment. Eric, meanwhile, leads Satoshi and Iris to the maintenance entrance to help them sneak inside Pokemon Hills. Elsewhere in the city, Myuutwo learns of what's going on over at Pokemon Hills and takes off toward the park as Satoshi, Iris, and Eric sneak into Pokemon Hills and discover that the Genosect are making a giant cocoon. Eric explains that the Ortus flowers (which is my best attempt at romanizing オルタス) were brought over to Pokemon Hills from the Alssace Natural Park (アルサス自然公園). Alsace, as in the region of France, is written out as アルザス in Japanese and is, like New Tork City, is only a single letter off from the original. As our heroes stare up at the cocoon, the Genosect Satoshi befriended earlier goes up to him and apologizes for attacking earlier! The Paleozoic pokemon then walks over to the Ortus Flowers floating in a nearby pond and explains that they used to blossom in its home. Our heroes soon discover that the cocoon, which our heroes deduce is the Genosect's attempt at recreating said home there in New Tork City, is causing trouble with the city's power supply. Eric runs off to the control room while Satoshi, Iris, the friendly Genosect, and Yamirami are asked to see what they can do about the cocoon. Suddenly, Myuutwo bursts onto the scene asks the Red Genosect to follow it so they can talk. The Red Genosect responds by charging at Myuutwo with Extreme Speed, hitting it in the chest and sending it flying through the city. Myuutwo eventually crashes into a wall and appears to loses consciousness. Back at Pokemon Hills, Dent arrives on the scene with the pokemon the Genosect had driven out of Pokemon Hills! The other three Genosect start to freak out at the sight of all these "enemies" and attack, and before long a melee breaks out. As the brutal battle unfolds, much to Satoshi's horror, the friendly Genosect rushes over to the pond to make sure nobody hurts the Ortus Flowers. Elsewhere, Myuutwo regains consciousness. The man-made pokemon rushes back to Pokemon Hills to ask the Genosect to stop one last time, but it soon becomes obvious that they have no intention of doing so. Myuutwo closes its eyes and begins to glow until, in a flashy burst of power, it transforms into a new "awakened form"! Myuutwo explains that if it can't stop the Genosect with words, it'll have to use force instead. The enemy Genosect change into their High-Speed Flight Forms and chase after Myuutwo. The prehistoric pokemon fire off attack after attack, but Myuutwo is able to dodge each and every shot. Myuutwo speeds ahead, so the Red Genosect uses Extreme Speed to chase after it. Much to its surprise, however, the Red Genosect is not able to keep up! Myuutwo suddenly appears from behind, attacks the Red Genosect, and then declares that "I am faster than you." 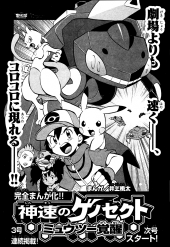 The preview at the end of chapter one says that Myuutwo will turn into its awakened form in this chapter. Eric works in the control room, trying to restore power to New Tork City. Back in Pokemon Hills, the Red Genosect is chasing after Myuutwo. Suddenly, the Psychic-Type is ambushed by the other Genosect! Myuutwo blasts them away with a Psycho Break attack, sending them flying into the basement below. The collision sets off a chain reaction that sets the Genosect's cocoon on fire, so Satoshi and the Pokemon Hills pokemon work together to put out the blaze. The Genosect look on in shock. Above, the Red Genosect blind sides Myuutwo, knocking it back into its regular form! Myuutwo picks itself up and is about to fire off a blast when Satoshi steps in between the two pokemon and asks them to stop! After a stirring speech, Satoshi is joined by the other three Genosect in opposing the fight. Myuutwo lowers its arm. The Red Genosect sees that everyone is against it and decides that they're all its enemies. It prepares to launch another attack, so Myuutwo rushes forward, turns back into its awakened form, and puts up a barrier just as the Red Genosect fires. Now left with no choice, Myuutwo grabs the Red Genosect and flies it higher and higher into the clouds. As Myuutwo and the Red Genosect approach the atmosphere, Myuutwo states that the two of them are going somewhere where they'll be alone. The conclusion of the story will be printed in the graphic novel release. It's due to come out on July 13th, 2013, the same day that The Extreme Speed Genosect and the Awakening of Myuutwo hits theaters. There was not any special preview for this chapter in the previous issue like there was for Chapter Two. Myuutwo and the Red Genosect reach the outer atmosphere of the planet and are mesmerized by the sun peeping over the horizon. As they gaze at the planet below, they both realize that they are all creatures who deserve life and that everyone is their friend. Myuutwo and Genosect decide to return home. Myuutwo faints as it passes through the atmosphere, so the Red Genosect rushes over and grabs it. The two are about to crash into Pokemon Hills when they suddenly find themselves...submerged in water? Satoshi explains that the Psychic-Type pokemon combined their powers with the Water-Types to create a water orb to cushion their fall. Once it becomes clear that the Genosect are no longer hostile, Satoshi asks Eric to take everyone to where he originally found the Ortus Flowers. Before long, the five Genosect start work on creating a new cocoon at their new home. Myuutwo thanks Satoshi for finding a home for the Genosect and says that it's glad that they met. As it flies off into the distance, Satoshi says that they'll definitely meet again.